Water, Glycerin, Dimethicone, Niacinamide, Polymethylsilsesquioxane, Polyethylene, Pentylene Glycol, C12-15 Alkyl Benzoate, Acetyl Glucosamine, Sodium Acrylate/Sodium Acryloyldimethyl Taurate Copolymer, Undecylenoyl Phenylalanine, Panthenol, Caprylic/Capric Triglyceride, Isohexadecane, Triethanolamine, Tocopheryl Acetate, Squalane, Dimethiconol, Stearyl Alcohol, Butylene Glycol, Behenyl Alcohol, Phenoxyethanol, Benzyl Alcohol, Dimethicone Crosspolymer, PEG-100 Stearate, Cetyl Alcohol, Polysorbate 80, Allantoin, Cetearyl Glucoside, Cetearyl Alcohol, Sodium Benzoate, Dipotassium Glycyrrhizate, Acrylates/C10-30 Alkyl Acrylate Crosspolymer, DisodiumEDTA, Laminaria Saccharina Extract , Sodium Hyaluronate, Iodopropynyl Butylcarbamate. Avobenzone (3%), Homosalate (9%), Octisalate (4.5%), Octocrylene (2.6%), Oxybenzone (2%). Water, Pentylene Glycol, Nylon-12, Polyethylene, Glycerin, Dimethicone, Sodium Acrylate/Sodium Acryloyldimethyl Taurate Copolymer, Isohexadecane, Tocopheryl Acetate, Stearyl Alcohol, Butylene Glycol, Behenyl Alcohol, Phenoxyethanol, Benzyl Alcohol, Cetyl Alcohol, Dimethiconol, PEG-100 Stearate, Polysorbate 80, Sodium Benzoate, Sodium Ascorbyl Phosphate, Cetearyl Glucoside, Cetearyl Alcohol, Disodium EDTA, Stearic Acid, Laminaria Saccharina Extract, Iodopropynyl Butylcarbamate. Clears skin without over drying Creamy cleanser Extremely Gentle DISCONTINUED Only sold as a set Pricey This is the only product I have found that loves my skin as much as I love the product. Not only is it gentle and non-irritating, it is effective! I am extremely disappointed that Olay has discontinued this product line. The only plus side to this is the fact that I found it half price at Ulta (22.50) and bought 2 boxes. Please, please bring this product back for the huge population of adult acne sufferers! So far, I love this product. I have tried everything and this is the first product that I have noticed significant skin turnover. When I do get a blemish, it is clear within a day or so using this product. My skin is also far less oily. I think other products stripped my skin and then my body over-compensated for the lacking oil. With this product, your skin definitely does not feel stripped. The first time I used the cleanser I was unsure if my skin was even clean because of the odd cream consistency. I will never go back to a foamy, soapy cleanser. This product is wonderful, the treatment works miracles, and the moisturizer is perfect under makeup. Nothing -No exfoliator -Gave me acne cysts -Made me break out more -Expensive -Doesn't last long Don't waste your time. Save your money. no scent great for sensitive skin actually works doesn't bleach towels easy to use one kit lasts almost 2 months easily available moderately pricey only sold as kit often run out of one step before the other two I'm now 33 and I've suffered from moderately severe cystic acne since my early teens. I have tried literally every product you can buy in drugstores and Proactive (which was awful). This is the ONLY product that has ever worked for me. It's a little bit pricier than some of the drugstore alternatives but it is WORTH EVERY PENNY (I usually stock up on several kits at a time when it goes on sale and I've found Walmart to be the cheapest place to buy it). I will never use anything else ever again and have recommended this product to all my friends and sisters who have similar problems. The cleanser is great and scent-free. I sometimes feel a slight tingle after applying, but nothing strong enough to be painful - and I have sensitive skin. Leaves your skin feeling soft and clean. Since using this and switching to mineral makeup my breakouts have almost completely stopped and I can go weeks with clear skin (a first for me!). Even when my hormonal cystic acne pops up at that certain time of the month, this product clears it up quickly - if I don't irritate my cystic acne by picking at it (hard to do!) my makeup covers it up beautifully (I use L'Oreal True Match Naturale mineral powder - also a little pricey but totally worth it!) and only I know it's there. 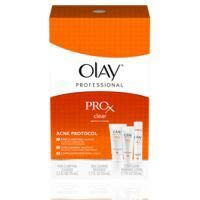 Using Pro-X Clear gets rid of my cystic acne within a couple of days and since I've started using it more than a year ago my post-acne discolouration has faded to practically nothing!! (again, something I'm now able to cover up with mineral makeup - something I was never able to do before) In my opinion this is by and far the BEST acne cleanser system you can buy and I've tried them all. For the first time in my life I have clear skin and that makes the small expense of buying this system worth every cent. cleared up adult cystic acne minimized pores on nose and chin reduced redness safe during pregnancy pricey can't purchase individually This is an excellent product and worth every penny. I have struggled with adult, cystic acne since going off birth control while we were trying to get pregnant. Other things I've tried that have failed: . dermatologist prescribed oral antibiotics . dermatologist prescribed topical treatments . rodan & fields unblemish system . pro-active . murad acne complex system I would definitely recommend this product if you've got persistent acne that just doesn't seem to respond to anything else. Doesn't bleach clothing, bedding Doesn't dry skin Doesn't work Expensive Company policies I will say that I liked the moisturizer it comes with, the fact that it's salicylic-acid based and doesn't bleach fabrics, and that it didn't dry out my skin. But this product did absolutely nothing for my acne. I'm not sure if this has anything to do with it, but I have late-onset acne that didn't start until my late 20s. I used it religiously, twice a day for 6 weeks and saw no improvement whatsoever. Since it cost so much and a money-back guarantee was offered, I saved my receipt and the entire original box. After 6 weeks, I called the 800 number listed and was told to what to send and where. So I did. A few weeks later, everything I sent was returned to me with a letter stating that the UPC I enclosed did not match. Yeah, right. So I called the 800 number again, spoke to someone named Beverly, and was told to fax everything to another 800 number. Needless to say, my money was never returned. So much for that "money-back guarantee".